On the first of every month, Expensify will bill the owner of group policies for the previous month's usage. 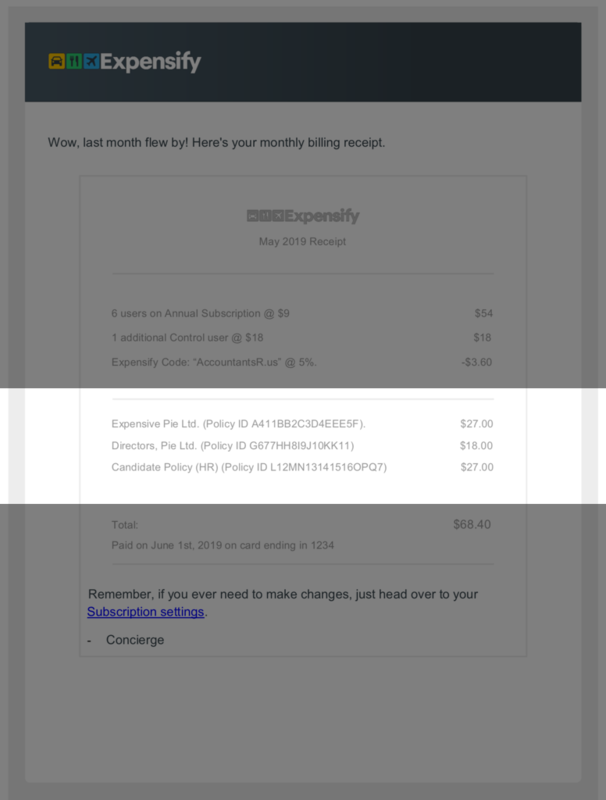 The billing owner will have the billing receipt automatically populate into their account; both as an expense, and as part of the billing history listed under Settings > Your Account > Billing. In this section, we breakdown the bill according to usage on all policies owned by the billing owner. Unique usage is assessed for each policy, and then an amount is assigned per policy. In the above example, there were 3 unique users on the Expensive Pie LTD. policy, 2 unique users on the Directors, Pie LTD. policy, and 2 unique users (including the additional Control user) on the Candidate Policy. If your Annual Subscription number is higher than the actual active use across all policies, the remaining charge will be evenly distributed across all owned policies. For example, if you have an Annual Subscription for 60 users but only 57 are active in the previous month, the remaining amount (3 x $ value of the plan) will be split evenly across all policies, with no upper limit. This is why you may see non-round numbers on your bill. The final section of the billing receipt lists the total amount and the details of the billing card against which the charge was made. There is also a direct link to the Subscriptions settings for your policies, which you can also access under Settings > Policies > Group > Subscriptions.